When organizations sit down during their annual strategic planning refresh, they often come up with an intricate strategic plan, starting with a vision statement that articulates a big-picture goal for the next three to five years. Creating the strategic plan is typically a big job that involves everyone from executive leadership to front line employees. Once the plan has been written and rewritten, it is finally released and communicated to the organization at-large. So what happens next? A strategic plan document is intended to provide an organization with a broad sense of direction, but does not necessarily include a blueprint for execution. To create a bridge between strategic planning and execution, organizations need a strategy management system, a methodology to regularly review performance and adapt to a changing environment. The first step in building a strategy management system is to create a strategy map. A strategy map visually translates the organizational vision into actionable financial, customer, internal, and learning and growth objectives. Each of these objective categorizations are called perspectives. Perspectives help organizations identify internal capabilities and their desired outputs. How an organization categorizes objectives on its map often depends on if it is a public, private, or non-profit institution. For example, many public sector organizations may choose to swap out financial and customer objectives in favor of budget and stakeholder goals. For more foundational information on perspectives and how they interact through cause-effect relationships, check out our full Balanced Scorecard primer. The strategic objectives on the map are action statements that provide a broad strategic direction for the organization. They provide big-picture direction, and will be further clarified with definitions and key performance indicators later on in the process. The Balanced Scorecard and strategy maps rely on cause-effect linkages to test the strategy. If an objective is falling short of expectations, there should always be a root-cause that strategic planners can investigate. The arrows on the strategy map identify those root causes. In the human capital example above, there are several internal process objectives that theoretically drive the performance of the objective, "Grow through new high value customers." If the metrics for new high value customers are poor, then the team might investigate an underlying objective's performance to find out why. Initially objectives are organized into perspectives, which are the horizontal cross-sections immediately visible on any strategy map. Themes are an optional way of grouping related objectives, typically visually represented in the internal process perspective. Because the internal process perspective usually has the most objectives, it can be helpful to group objectives into thematic areas. The strategy map itself should act as the starting point for any strategy review meeting, and will act as a sort of visual agenda for the discussion. 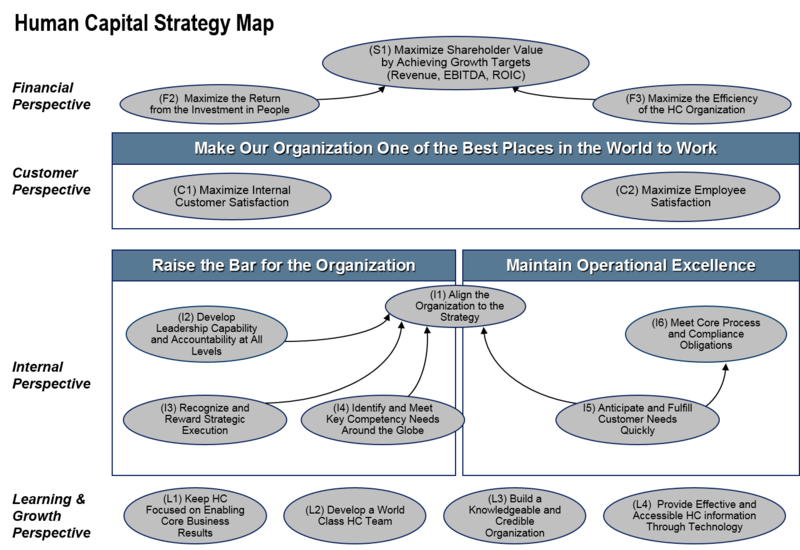 Many maps include the vision statement at the top of the map as a reminder of the overall organizational direction. And because the strategy map provides leadership with such a simple view of concrete objectives, it allows the team to quickly digest performance across the organization. Optional status colors also provide an extra layer of performance detail to the top-level view. A simple red, yellow, green color status help leadership quickly identify areas requiring further discussion. Some teams also include the initials of the owners for each objective to drive clear accountability right from the map. These extra levels of meta-data such as ownership and status colors can be easily automated by Balanced Scorecard software. There are tons of generic PowerPoint strategy maps out there. And they’re a great starting point while your strategic planning team works out what the content should be. Once a draft is close to final, it is a good opportunity to get any graphic designers involved, if available. Artists can help make the map engaging through illustrations that go beyond the typical “bubble chart” PowerPoint slides. In the above example from a women’s retailer, houses and roads take the place of objectives and arrows to show how the company will scale the metaphorical mountain of financial success. Getting the entire team engaged with the strategic plan can often pose a challenge. The full strategic plan document can be quite lengthy and difficult to summarize in a couple of quick points. The strategy map offers a neat, one-page solution to strategic communication problems. Office walls and intranet sites are great places to post the strategy map. We’ve even seen especially creative clients create pens with little expandable strategy maps to get the word out. 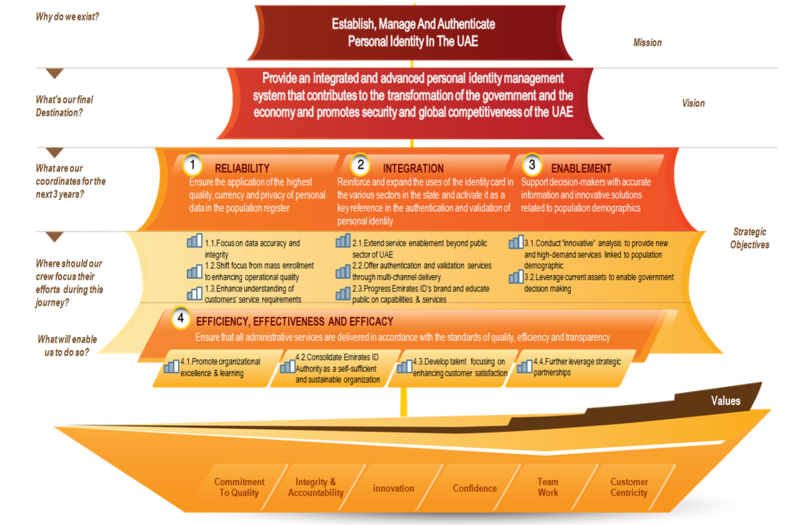 A little help from graphic designers can go a long way, as seen in the award winning Emirates Identity Authority map below. Looking to get started designing your map? Check out our 50 free, editable strategy map templates so you don't need to start from scratch. Want to learn more about Balanced Scorecards? Check out our blog.